Continuing on the talks during Lent about prayer, Mark asked me to speak about a prayer tool that I find really helpful. I know many of you as I do, still remember when telephones were for making calls and you had to walk to a red box at the end of the road to make a call, I also recall if you wanted to listen to something on the radio or watch something on TV, you had to be there or you missed it, no catch up or downloads…………. So I like lots of you have seen huge changes in technology and whilst I am no Geek or Whiz when it comes to gadgets, I have learnt to embrace and utilize the technology that makes life easier, or gives us access to things. 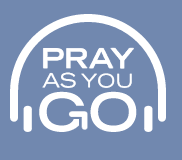 You may be wondering what all this has got to do with Prayer – well for some years I have been using an App on my phone and tablet called Pray As You Go, it is a daily prayer session, designed to go with you wherever you are, to help you pray whenever you find time, but particularly whilst travelling to and from work, or school, studying or just having a quiet moment. I find I need structure when I pray, or my mind wanders and I am easily distracted, so listening to Pray As You Go, while I am getting ready in the mornings gives me that structure – it brings me closer to God, it focuses my mind, gives me a framework for my day, and calms and relaxes me before I get in the car to work and the traffic queue!! 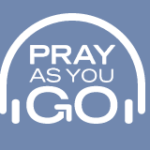 Also on the App are different prayer tools and reflections which are excellent if you have a bit more time. I really highly recommend it, do try it and I would love to hear what you think.